A top racing driver for 28 years, Louis Wagner holds the distinction of winning the inaugural GPs held in America and in England. With his serious expression and piercing blue eyes, a sense of fair play was paramount for this Frenchman. He began racing cars in 1903, while still in his teens, for Darracq. 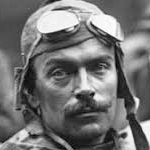 He was running third in class in that year’s ill-fated Paris-Madrid race when it was stopped at Bordeaux however he took victory later that year in the voiturette class at the Circuit des Ardennes at Bastogne, Belgium, a feat he repeated in 1905. In 1904 he was one of the drivers in the Darracq team for the Gordon Bennett Cup in Germany, finishing 8th and in again in 1905 at the Circuit d'Auvergne in Clermont-Ferrand though he was eliminated in the first round. In 1906 he retired from the very first GP the GP de l’Automobile Club de France at Le Mans but in America it was a different story, winning the Vanderbilt Cup driving a Darracq model 120 over the Long Island racecourse having led the whole race. Even a late tyre stop did not prevent him taking victory. The Cup was unfortunately marred by poor crowd control. In 1907 Wagner left Darracq after being criticised following his retirement from the Targa Florio that year. He joined Fiat and was 5th in the Kaiserpreis in Germany then the following year in Savannah, he won the first ever United States Grand Prix for FIAT. The last 25 mile lap saw a close four-way duel be he took the win despite his riding mechanic, Antonio Ferro, having to hold a temporary oil tank between his knees for the last 100 miles. After finishing second in the 1912 French GP with a Fiat S74, his racing took a back seat to his flying as chief test pilot for la Société des monoplans Hanriot, a company started by fellow racing driver René Hanriot. He did race for Mercedes in 1914 at the French Grand Prix at Lyon and finishing second again, this time behind his team-mate Christian Lautenschlager. World War I, in which he served in the French artillery, further curtailed his racing however he resumed racing in on cessation of hostilities, at the 1919 Indianapolis 500 driving a Ballot however he retired on lap 45 with a broken wheel. He returned to GP racing in 1921 finishing seventh in France for Ballot and third in Italy with Fiat. Back to 1924 and year began with Wagner finishing ninth on the Targa Florio despite his car hitting a policeman during the race. The team dominated GP racing. Wagner came fourth in France and second in Italy with the Alfa Romeo P2. He made his le Mans debut in 1925 driving for Ariès in one of their Type S GP2 cars, finishing 2nd in class and 6th overall. He finished second on the Targa Florio for Peugeot and, sharing a Delage with Paul Torchy, finished second in the French GP. He remained with Delage for 1926 and finished third in the Spanish GP sharing with a young chap by the name of Robert Benoist. In 1926 he teamed up with Robert Sénéchal driving a Delage 155B to victory in the first ever British Grand Prix. His own Delage 15S8 retired after just six laps of Brooklands but he took over Robert Sénéchal’s second placed car at three-quarter distance drove it to victory. In August he had further success when he won the Grand Prix de la Baule in a Delage 2LCV. He also raced a Peugeot at the 24 hours of Le Mans. It was Peugeot's debut at Le Sarthe but the 3.8 litre Type 174 Sport did not have a happy time and both cars retired (though not through serious mechanical failure). His final Grand Prix came in France in 1927 and his very last race was the 1929 Targa Florio.